All-purpose flour works in many baking situations, but it's not right for every cake. Flour contains protein, which forms gluten when mixed or kneaded. Gluten gives yeast breads their chewy, rustic texture, but it makes cakes tough and dry. The lower the protein content of the flour, the more tender a cake. 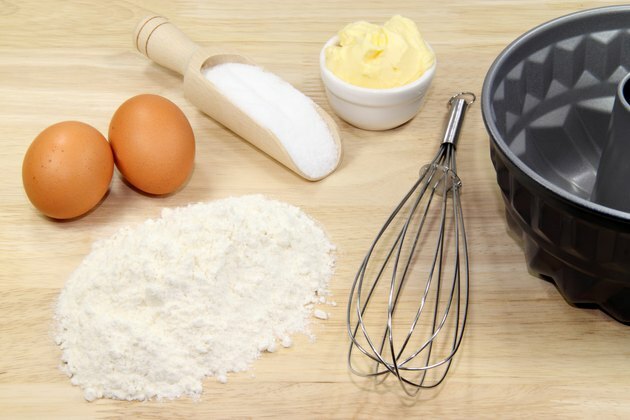 Match the flour you use with the type of cake you're baking. Cake flour is the best choice when you're making a cake with a fine, tender crumb, such as pound cake, devil's food cake or sponge cake. Cake flour is milled from soft wheat, and contains between 5 and 7 percent protein. This low protein content means little gluten is formed when you mix the batter. Cake flour undergoes a bleaching process that helps it absorb moisture and provide structure to the cake. Most cakes have a high ratio of butter and sugar to flour, and can otherwise become too soft. Cake flour has a fine texture and can clump. Sift it before you mix it into the batter. Similar to cake flour, pastry flour has between 7 and 9 percent protein. It's often hard to find in the grocery store, but it can replace cake flour. All-purpose flour, as the name implies, can be used in breads, cakes and cookies. It contains between 7 and 12 percent protein, depending on the brand. A cake made with all-purpose flour won't be quite as tender or have as fine a texture as one made from cake flour. Use it to make homey, rustic cakes, such as upside-down cake or a dense chocolate cake. Bleached all-purpose flour has less protein than unbleached flour and generally makes a tenderer cake. Bleached all-purpose flour is also a good choice when you want a pure white cake. Nutritionally, whole-wheat flour is superior to regular all-purpose flour or cake flour because it contains both the germ and the bran. It gives cakes a slightly nutty flavor and a dense, robust texture. Use whole-wheat flour in dense fruit cakes, such as carrot or applesauce cake. If you've never worked with whole-wheat flour before, try replacing one-fourth to one-half of the all-purpose flour with whole-wheat flour. If you're satisfied with the results, use a bit more the next time. Unless you bake a lot, all-purpose flour is the one to keep in your pantry. This flour provides satisfactory results for almost any cake. If you can't find cake flour, use all-purpose bleached flour in delicate cakes, but omit 2 tablespoons of the flour for each 1 cup in the recipe. Don't use bread flour in cakes, because its high protein content almost ensures a tough cake. Self-rising flour is usually made from soft wheat, but it contains a leavening agent and salt, which can make it somewhat unpredictable. If you use it in a cake, omit the baking soda or baking powder and salt from the recipe. What Is the Difference Between Baking Flour & Plain Flour?